Ixobelle (archived): What's the Rush? I haven't bought Aion yet, but intend to shortly. I still have the prepay $5 thing from BestBuy, and that's the only reason I haven't just jumped online and bought the client digitally. Five bucks is SRS BIZNS, k? I've been reading a lot of stuff, though, about people claiming it's a huge Korean Grind-o-thon to end game, and maybe wondering if I really want to get sucked up in that right now. WoW's siren call seems to ebb and flow, and just when I think I can't stand another Ony PUG, I join up with a cool guild, and everything goes good for a few weeks. Then the guild falls apart when the GM doesn't log on for 3 days... his mom had a stroke, and I was apparently the only one that didn't mind not raiding for a whole week. Back to Aion, though. How would anyone that has bought it, and has been playing it, rate it on a fun scale? Before you answer that, though, think about how you're playing it. When I got into WoW's beta, MMOs were new to me, and I poked around in a horrendously inefficient manner for a good few weeks and months before realizing there were even things like spell coefficients and stuff. Actually, it was probably a good year before I knew about a spell coefficient. I just played the game abnd had fun. 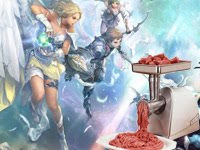 What I'm hearing about Aion is that in order to reach the level cap, you have to grind your eyeballs dry, and that powerleveling a tradeskill to max requires afking your computer overnight to cook up 200 recipes while you sleep or whatever. All which leads me to ask: What's the big rush? Have MMOs ruined the enjoyment of playing a game? Has the simple act of learning to play a class been horrifically overshadowed by not being a jedi master by the time you leave the store with the box? By reading the box back, you should already know optimal sustained DPS rotations or srsly jus gtfo k thx. I played the Aion Chinese client before it was even open beta for English speakers, and what I found was pretty fun. It was basically WoW, which didn't bother me, but with an overhauled graphics engine, and new classes and spells to learn. People are already complaining that the class system is too rigid, and forces you into a specific playstyle, which could be a design flaw, but then I remember WoW, and how if you aren't specced X/Y/Z as a certain class then you're doing it wrong. The choice is there, but it's fake. There's really only one optimal spec for each tree, and usually only one or two of those trees are viable for PVE, and one for PVP. Rigid classes don't really bother me. I intend to take it as it comes, and when I reach the level cap (if it holds my interest that long), then I'll worry about what to do then. I'd be curious to hear from any of you playing it, though, and how you're approaching it. Breakneck leveling or just putzing around, and how it's all feeling for you at this point. I reckon I'm gonna just jump online and put it on my card day, $5 prepay be damned! I talked a bit about it in a post a few days ago, but it might not apply to you: for me the rush is that the "real game" doesn't happen until higher levels, and you end up having to do a questing grind just to get to the game. I enjoyed Aion for a while in beta, and for a few weeks on live, but feeling disconnected from other players and the game eventually took their toll, especially considering how similar the environments were for the first 20 or so levels. I thought the game was beautiful, and combat was fun, but I got tired of always fighting the same mole-people as Elyos (Asmodean mid-levels were more fun, imo). Add in how boring and grindy the crafting system is, and I start to wonder if the investment is worth it. Will I stick with the game long enough, and will the crafting rewards be good enough, that all this mindless grinding was worth it? So far, all I found was that I was wasting hours of time crafting. It's OK in WoW because I know what I'll get in the end, and exactly what that's worth to me. In Aion, it's harder to keep that commitment up because I have no way of knowing how much I"ll enjoy the endgame or how rewarding all the work will be. When the activity itself isn't fun (and thus the journey itself isn't fun) then you end up rushing through it to get to the fun stuff. At least, that's my take. I've been wondering how this game is myself... it might not be my new favorite game, but it might be fun to play around with it for the first free month just as a diversion. Not really intending to get to endgame and be awesome, just feel like exploring the experience. The heavy PvP focus of the game makes me pretty hesitant though. I myself love the game, and feel the game is "real" throughout. The first part of your adventure is reclaiming your memories, and if that means nothing to you then perhaps one might need to slow down and read some of the quest texts to see how your character is developing. Just to prove I actually do play this game, here is my aion character link. That link will show you my character, his level, his gear, and even what he looks like ingame with a character preview! Stand in awe at my character. Back on track, the first levels deal a lot with the lore behind your character, and if you mindlessly click through quests then I imagine you may get the feeling that its a grind. However, even some of the most random and seemingly trivial quests have great stories to them, with short cinematics to them. I myself very much enjoy looking at what spells I will be learning in the next couple levels, and buying the books ahead of time so that right when I ding, I use them and learn them all right away. It's sort of a motivation for me to continue leveling, as if the story of my character unfolding wasn't enough. I wont explain the story to you, as it would be a spoiler. However, I assume you, the game can be enjoyable if you enter it not wanting/needing everything to be the same as WoW. People complain about limited flight, how long it takes to get to level cap, however none of that matters to me. All these things aside, I find myself leveling a lot like I did in WoW in the sense that I am constantly seeing what spells I will be getting next, and salivating at the mere thought of them (metaphorically speaking). Different then WoW, though, I am much more immersed in the lore and backstory of not only Atreya but my character himself, and that to me is something WoW offered next to none of. Your character in WoW holds no specific meaning, just another mage. Just another rouge. In Aion, you were once the shining greatsword of your countries army. Where your people needed to be defended, your mere presence would send ripples through the Aether, and turn the tide of the battle. There is much to love in both games, WoW and Aion- but I find myself having an affair with my mistress, and may be breaking it off with the wife. oh snap! that little 3d armory thing is pretty cool. yeah, since posting this, I bought it online, and have been plugging away in the starter area, I'm almost exactly up to where I was with the chinese client (at level 5), and like it. Im having fun still, and am enjoying the pace of leveling. Crafting is a giant time sink but from what I've seen its worth it as far as a monetary reward goes. I've never been a big crafting guy though but good player made items sell for a decent sum it seems to me. http://na.aiononline.com/livestatus/character-legion/search?charID=65313&serverID=9Thats my guy, and if you stuck to your earlier satement about rolling elyos on Yustiel ill see you in the abyss. It is like any other MMO in that your attitude is really what makes the difference. The first week I thought I wouldn't make it in this game, the gold spam was out of control and I didn't feel a real connection with my character. They've since fixed the spam. Once I slowed down and started looking around at all the detail in this game I found there are so many small things I love. And I love that it isn't too easy, if I get an add or two there is actually a chance I won't make it out alive. That's my perspective from a level 17 cleric so far, I've still yet to group or join a legion. I completely agree with Daria in that there are many small things in the game that can be overseen if not given the time of day. For me, my day was made by the fact that when I cancel a firebolt, a nice bit of smoke came from my hand letting me know the fire had fizzled. Ooh! I still have my 5 bucks down on it at Gamestop and have been thinking about going to get it (played Asmodean in beta and actually enjoyed it quite a bit). The only problem is that for me MMOs are all about the people with whom I play. All my friends still play WoW and even in WoW I nearly quit and just before I did I met the guild I rolled with for years. I want to give Aion a whirl, but unless I can play with people I know I don't think I'll buy it. Why do you want to play Elyos instead of Asmodean anyway, Iso? you still owe me gamecards you noob.